Russian ethnographer; born in 1826; died at Riga Aug. 14, 1900. He studied at the University of Moscow, and after conversion to Protestantism he became in the fifties a teacher of Russian in the district school of Tula and later in the school of Yasnaya Polyana, established by Count Leo Tolstoi. Deeply interested in the language and customs of his country, he devoted himself to the study of Russian folk-lore, and notwithstanding the fact that he was crippled he visited numerous villages and hamlets in various parts of the country, collecting songs and stories from the peasants. 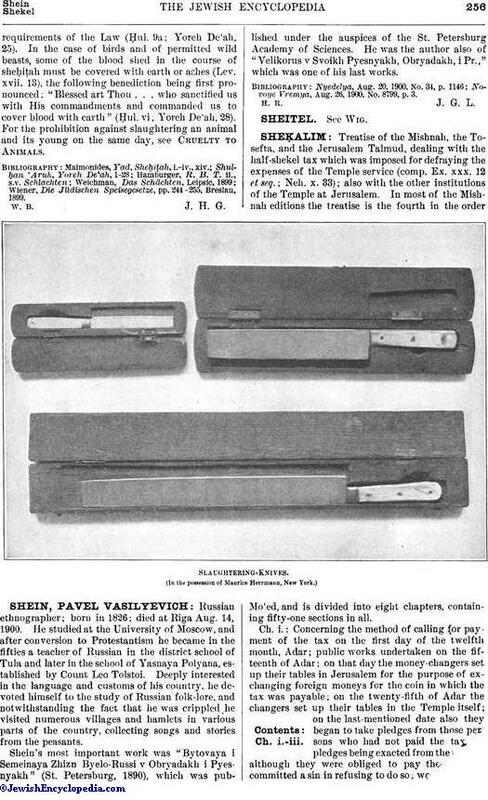 Shein's most important work was "Bytovaya i Semeinaya Zhizn Byelo-Russi v Obryadakh i Pyesnyakh" (St. Petersburg, 1890), which was published under the auspices of the St. Petersburg Academy of Sciences. He was the author also of "Velikorus v Svoikh Pyesnyakh, Obryadakh, i Pr.," which was one of his last works. Novoye Vremya, Aug. 26, 1900, No. 8799, p. 3.